What is it? 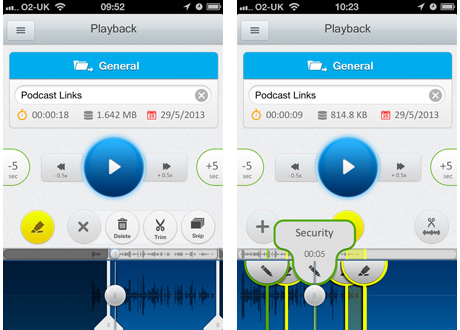 An audio recording and editing app that allows you to tag and highlight audio. It has handy save options, letting you open the file in another audio app, save to Dropbox or Google Drive or share via wifi. Any journalist who records audio for their notes or for broadcast will know there are a whole host of apps of audio apps available. This new app deserves a download as it has some handy features, such as allowing you to save to Google Drive. Recordium, which was released into the App Store on Saturday, lets you select whether you record in aiff, wav, caf or mp4. You can then edit the single track audio and either trim (by highlighting the section you want and deleting the rest) or delete (highlighting the parts you don't want). Compared with some other audio apps, this one is really intuitive to use too. There is a speed up and slow down function allowing for a precise edit. You can highlight audio, either by adding a marker while you are recording, or adding one later. And you can also tag audio, making it easy to find specific sections or to search for the track later. There is also a notes option so you can annotate a specific point in the audio. The video at this link provides a quick walkthrough. In an email to Journalism.co.uk, the creators or Recordium said that the new app has so far reached a top 10 position within the App Store's business category in the US, and a top five ranking in several countries, including the Netherlands and China. Have you got a favourite app that you use as a journalist? Fill in this form to nominate an app for Journalism.co.uk’s app of the week for journalists.